Amazon's Kindle e-reader store has a spam problem, and that isn't good news for legitimate authors and consumers trying to find their books. The reason spammers have had such success is partly because self-publishing an e-book to Amazon.com is so easy anyone can do it. One solution could be to start charging authors to publish an e-book. Changing the economics should drastically reduce the number of spam titles. 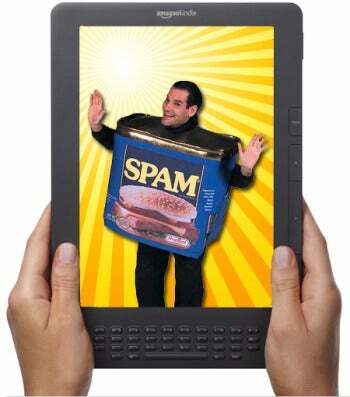 Currently, any sales of spam e-books are pure profit for spammers, encouraging them to publish dozens of titles in the hopes of just selling a few copies of each to make their time more than worthwhile. Charging authors $50, $20, or even just $10 to publish to Amazon would drastically cut back potential profits for spammers, and any author that spent months or years crafting a quality work should have no problem shelling out a small amount to access a global market and ensure that there's fewer titles to weed through. The spammers have been utilizing two tactics. The first is to use available software that advertises the ability to easily publish 10 to 20 Kindle books per day by basically grabbing public domain content from elsewhere and slapping it up on Amazon with a new cover. Ironically, if you don't want to use the software, there's plenty of e-books available on Amazon that will teach you how to flood Amazon with spam e-books. The second spam-publishing method involves copying an already successful e-book and republishing it with a new author, title and cover aimed at a slightly different audience. A number of authors have been surprised to find their Kindle-published works available under different titles and bylines elsewhere on Amazon. There is some sort of internal approval process within Amazon that it takes most titles less than 48 hours to pass. With such quick turnover and the multitude of new titles being electronically published to the site every day, it's easy for spammers to mix in with legitimate authors. For its part, Amazon is trying to fight back against the spam when it comes to short titles. The Kindle Singles store features hand-picked and curated selections that are shorter than the average book-length title. Unlike the 48 hours it takes a self-published title to go live in the main Amazon store, it can take up to two weeks to receive approval for a spot in the Kindle Singles store.